Chimpanzee Information: Is a Monkey, Chimp, Lion or Tiger living next to you? Is a Monkey, Chimp, Lion or Tiger living next to you? Readers, I just posted some information today about how you can tell whether a sanctuary is a good or bad one. it's worth reading, just a few posts down. This is NOT a sanctuary!!!!!!!! This is why people get confused about what is good and what is bad. The most important thing is that a Real Sanctuary DOES NOT interact with the animals!! That is not sanction for the animals. Anyone that thinks you can take the wild out of a wild animal is disillusioned! I know I worked with them for over 15 years. Once a wild animal always a wild animal. Look at the Travis/Sandra Herold/Charla Nash case. Travis was like a child to Sandra, she slept with him, lived with him in her home and he did all of the things that humans did but...... one day his wildness came out. Not only did he attack Charla but then tried to go after the person that loved him more than anything, the person that raised him from a baby. You just can't make them domestacted no matter what you do or how long you do it for. I had rescued a toothless monkey once and even with no teeth he broke a few bones in my hand by rapid biting me. I hope when this movie comes out they don't put a spin on it that makes it look "cool" to own an exotic animal. I once met a tiger that was suppose to be put to death because he had pulled a woman with his paw to the edge of his cage and he ripped her apart through the cage!!!!!. Before the authroites could take the tiger the owners moved him to another facility and that's where I meet him. He was housed alone because he couldn't be trusted with any other tigers. People that own exotic animals should have in their wills to donate their organs because their death will surly come. Just a few pages into a book given to him by a friend, Michael Webber couldn't believe what he was reading: Thousands of Americans keep exotic wildlife, from tigers to lethally poisonous snakes, in their homes and yards -- absolutely unregulated. "It just seemed bizarre to me that there are some areas of the country that require you to get a dog license to own a poodle, but in that same area, you can get a tiger and raise it in your home," the Hollywood TV and film producer says by phone from Ohio. "Or you can get a venomous snake, a python, a chimpanzee, and there is absolutely no licensing requirement or oversight. Your neighbor can even stick an elephant in the back yard and there is nothing you can do about it." The book, "Wildlife Warrior: More Tales Of Suburban Safaris" by former animal-control officer Tim Harrison, became the beginning of an odyssey for Webber, which led to the new documentary, "The Elephant in the Living Room," which opens at selected theaters in Denver next week. The movie explores the strange and often shadowy world of "exotic" wildlife in the United States, from marketers and auctions to owners who have formed a deep attachment to their "pets." It focuses on Harrison, who has avidly crusaded against ownership and marketing of wildlife, and Terry Brumfield, an Ohio man who raised and kept two African lions, Lambert and Lacey, in his home. Boulder native Pat Craig, founder of The Wild Animal Sanctuary in Keenesberg, appears in "The Elephant in the Living Room." Camera file photo ( JON HATCH)touching, even cute, but it's anything but. Lambert, the male lion, escapes onto a local highway, where he is reported for chasing down speeding cars (911 operators were understandably incredulous). After that, the authorities give their owner an ultimatum: give the lions away, or keep them penned up. Brumfield, who formed deep emotional attachment to the lions as cubs, when he was recovering from a severe accident, reluctantly keeps them in a cramped, filthy horse trailer, where they live for several months. The film mostly walks a carefully non-judgmental line, and Webber even confesses that he formed a bond with Brumfield, who comes off as well-meaning but clueless. "These aren't evil people," Webber says. "They are people who love animals, arguably more than most people out there. They have a strong connection to their exotics, even stronger than some people have for their dogs or cats." The story of Harrison's gentle attempts to persuade Brumfield to give up the lions is interwoven with harrowing tales of animals turning on their owners, hidden-camera footage of the people behind the exotic market and interviews with people on both sides of the debate. But despite the sympathy he developed for Brumfield, Webber says he came down on the side of those who want to limit and regulate, if not ban, the ownership of most wildlife in the United States. "I just experienced all the negative sides of this, for the animals and the owners," he says. 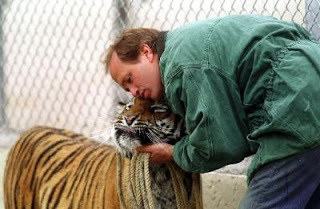 Pat Craig, a Boulder native who is founder and director of the Wild Animal Sanctuary near Keenesburg on the eastern plains of Colorado, appears in the film. He advised Webber and Harrison, and eventually took in some of the animals shown. "For me the movie represents a great educational tool. Joe Public will see it and say, 'Wow, that is a huge problem.' I'm a real fan of the movie in that sense," Craig says. But he is uncompromising in his refusal to "coddle" people who take in animals that they will deprive of a natural habitat and life, and for which almost all are unequipped to care for. He even criticizes Webber and Harrison for succumbing on camera to the lure of some lion cubs. "All these people love their animals," Craig says. "But they either provide for them or don't provide. I don't doubt that (Brumfield) loved his lions. ... But we learned a long time ago that being sympathetic, having any hesitation initially (with owners) will end up costing the animals." Craig points out that virtually all large exotic wildlife goes without any veterinary care simply because most vets won't -- or can't -- handle them. Most people have no exotic animal husbandry skills and almost none can provide a suitable habitat for say, a tiger, a bear, or even a large snake. 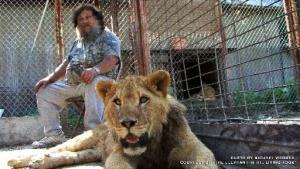 Terry Brumfield, an Ohio man who kept adult lions at his home, in "The Elephant in the Living Room." Courtesy photo. animals," Craig says. "But they either provide for them or don't provide. I don't doubt that (Brumfield) loved his lions. ... But we learned a long time ago that being sympathetic, having any hesitation initially (with owners) will end up costing the animals." Since animals are considered property in most states and seizing them often results in lawsuits, Craig advocates laws requiring that owners pay for liability insurance. "We should require a million dollars worth of insurance," he says. "It's amazing how so many owners who say they would never give up (an animal) find out they have to pay insurance premiums and suddenly say (screw) it." Large carnivores get most of the film's attention, but it notes that Americans own everything from chimpanzees to poisonous snakes such as the deadly gabon viper. The non-profit, all-volunteer Colorado Reptile Humane Society in Longmont, which handles everything from small lizards to venomous snakes such as western diamondback rattlers, constantly battles the problem of people taking in animals they can't care for. "Calling them exotics is funny to begin with," says associate director Jonathan Sculpin. "The only extraordinary thing is that we humans have taken them out of their natural setting. ... People put a 5-foot long snake an aquarium. But in the wild that animal has at least an acre of habitat over which it roams." And as the film makes clear with breathless local TV stories, when wild animals behave like, well, wild animals, they tend to take the blame. "In North America, we think the role of a tiger or a lion or a chimpanzee is to put clothes on them, to dress up a chimp in an Old Navy commercial with a spoon. But eventually, if (the chimp) tears your face, your genitalia, your hands and feet off, we say it went bad. But that is what a chimp is meant to do," Webber says, recalling a horrific 2009 incident in which a "pet" chimpanzee attacked a woman in Connecticut. News reports said neighbors were "shocked" by the animal's behavior. An emergency room physician in the film, Dr. Roger Paholka of Miami Valley Hospital in Dayton, Ohio, shakes his head at the many cases he's seen of exotic pets harming people. "We see them as safe and cuddly, as opposed to people in Africa, who see them as something that wants to eat your face," Paholka says onscreen. But both Webber and Craig regret that public debate over the issue -- to the extent that there is any -- tends to be focused on public safety to the exclusion of the animals' welfare. The film ends with brief footage of animals rescued and released into the grasslands at the Wild Animal Sanctuary, a stark contrast to their earlier extreme confinement. "These are non-domesticated, majestic animals," Webber says. "After the initial fascination, you become sad. Gosh, that tiger is never going to run, never hunt, and hopefully never breed. It is never going to be able to do things it was programmed and designed to do."